Ali was poor, uneducated and had little hope of attaining much in life. However, his future changed dramatically when at 12, his bike was stolen and he went to a ring and learned how to formally box. The rest is history. He has risen to being the most recognizable face on the planet. He rose from obscurity to being friends with kings, presidents and ordinary people. 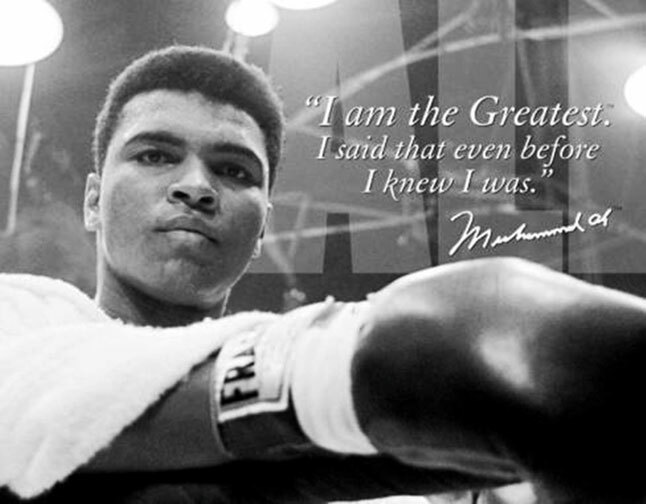 He shook up the world and paved the way for many athletes and black people in general. He was bornCassius Clay on January 17, 1942 in Louisville, Kentucky, USA but changed his name to Muhammad Ali when he converted to Islam.In 1960, at the age of 18, he won the Light Heavyweight gold medal in the Summer Olympics in Rome. Immediately afterward, he turned professional as a boxer. He has won 56 of his 61 professional fights, with 37 by knockout. In 1964, at the age of 22, Ali won the heavyweight championship from Sonny Liston in an upset. He has also been involved in several historic boxing matches. Most notably are the “Fight of the Century”, “Super Fight 11” and the “Thrilla in Manilla” versus Joe Frazier and the “The Rumble in the Jungle” versus George Foreman. He won the heavyweight championship an unprecedented three times (1964, 1974 and 1978). All of this came to an end, when he retired for good in 1961 at the youthful age of 39. Ali is regarded as one of the most significant and celebrated sports figures of the 20th century and is widely considered the greatest heavyweight fighter of all time. Sports Illustrated named him as Sportsman of the Century. He was known as the “Greatest” and “the People’s Champion.” He was also known as “the Louisville Lip” because of his outspoken and his boastful nature. Ali fought both in and out of the ring and is known as an inspiring and controversial figure. He took unprecedented stands against issues that existed in the late 1950’s and in the Civil Rights Movement of the 1960’s. He opposed the Vietnam War and refused to report to military service, declaring himself a conscientious objector and stating that he had no issueswith the Vietnam people. This unpopular stance led to him being sentenced to 5 years in prison and fined $10,000. He was also stripped of his Boxing title and from boxing for 3 yearsby the New York Boxing Commission when he was at the height of his career. He then spent the next three years speaking out against the War as well as many other issues. He became a leader and a champion of black people and the underserved.He appealed to the U.S. Supreme Court which overturned his conviction in 1971. By then he had lost 4 years of peak performance of his athletic career. Despite his dominance in the boxing ring and his brash self-confidence, Ali was extremely kindand sensitive outside the ring. He was compassionate to people in need and started numerous charities that made a difference in the lives of a variety of people. At the age of 42, Ali developed Parkinson’s disease as a result of thousands of head shots received during boxing.He inspired the young and stayed strong and brave in bearing the burdens emanating from his Parkinson’s disease. During his many struggles, he never lost his sense of humor. This disease ultimately took his life last week, on June 3, 2016 in Scottsdale, Arizona at the age of 74. He is scheduled to be laid to rest on Friday, June 10, 2016. Scheduled to be in attendance are ordinary people as well as many dignitaries such as Will Smith, who portrayed Ali in a recent movie as well as many other notables. Slated to deliver the Eulogies are former President Bill Clinton, Billy Crystal and Bryant Gumbel. The procession will begin at 9am and travel along a street named after him – a route that includes locations that were historically important to him. Muhammad Ali was married 4 times and leaves behind his wife of the past 30 years, Yolanda Williams, 9 children (7 daughter and 2 sons) and a brother.